Mrs. Fannie Ford, 91 of Colt, died on August 12th, 2018, at St. Bernards Medical Center in Jonesboro, AR. Mrs. Fannie was born April 30th, 1927 in Colt AR, to her late father Mr. Walter Adams and her late mother Mrs. Lucille Lewis. Survivors are her children Mrs. Beulah Guydon of Grand Rapids, MI, Mrs. Louvenia Ford of Colt, AR, Mrs. Clarette Hayes of Arlington, TX, Mrs. Patricia Ford of Colt, AR, Mr. Louis Adams of Grand Rapids, MI, Mr. Elsie Lee Ford Jr. of Grand Rapids, MI, Mr. Randy Ford of Arlington, TX, and Mr. Gregory Ford of Arlington TX; brother, Mr. Mark Love of Grand Rapids, MI; sister, Mrs. Catherine McClain of Hudsonville, MI, and many other relatives and friends. 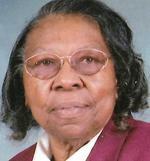 The Funeral Service for Fannie Ford will be at 11:00am on August 18th, at Mt. Moriah MBC, Caldwell, AR. Interment will be in Stanley Grove Cemetery, Colt, Arkansas. The family will receive friends from 1:00pm - 5:00pm on August 17th, 2018, at CLAY FUNERAL HOME, 2522 East Broadway, Forrest City and from 10:00am- 11:00am on August 18th, at Mt. Moriah MBC, Caldwell, AR. This obituary is protected by copyright by Clay Funeral Home. Proudly Serving the Community of Eastern Arkansas Forrest City Wynne Marianna West Memphis Blytheville Turrell Jonesboro Brinkley Hazen . Clay Funeral Home is located in the state of Arkansas, United States.